VW is aiming to launch more than 70 new pure EVs during the next decade, which means over a quarter of its vehicles will be electric by 2025. German carmaker Volkswagen (OTC Pink:VLKAF,FWB:VOW) and Chinese top lithium producer Ganfeng (OTC Pink:GNENF,SZSE:002460) have signed a memorandum of understanding (MOU) on long-term lithium supply for battery cells. The step is a major move in the race to secure raw materials for the electric car (EV) revolution. The automaker is aiming to launch more than 70 new pure EVs during the next decade — that means that over a quarter of its vehicles will be powered by electricity by 2025. Volkswagen is forecasting to have 22 million EVs worldwide by 2028. “We must make sure we cover [raw material] demand [for cell production] at an early stage. Long-term agreements like the one for lithium, a key raw material, that we have just concluded with Ganfeng are therefore of crucial strategic significance for implementing our electric offensive,” said Dr. Stefan Sommer, a group board member for components and procurement at Volkswagen. 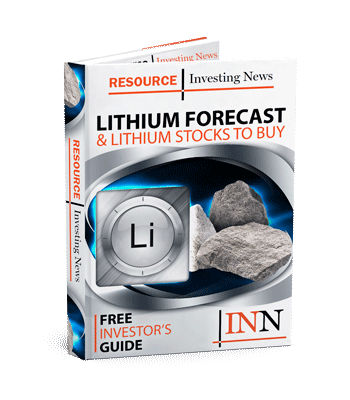 Demand for lithium, a key battery metal together with cobalt, graphite and nickel, is set to significantly increase in the coming years. According to Benchmark Mineral Intelligence, demand for the metal could surge from 162,752 tonnes in 2017 to 1,570,020 tonnes by 2028. “With Ganfeng as a strategic partner, we are creating a secure basis for planning capacities and costs,” said Michael Bäcker, head of corporate purchasing, e-mobility, at Volkswagen. The carmaker said it is interested in lithium extracted from mining for lithium hydroxide, because it is commercially more attractive, more stable to extract, easier to scale and generally more sustainable. “We are focusing on lithium from the mining industry, because this form of extraction means more stable prices, guaranteed capacities and transparent sustainability,” said Bäcker. Chinese producer Ganfeng has interests in six lithium resources in Australia, Argentina, China and Ireland, but its primary source of lithium raw materials is Mount Marion in Western Australia. The project produced 226,000 wet metric tonnes of spodumene in the first half of the 2019 financial year, up from 221,000 during the same period last year. Earlier this week, the Chinese top lithium producer made a US$160 million investment to develop the Caucharí-Olaroz project in Argentina, forming a 50-50 joint venture with Lithium Americas (NYSE:LAC,TSX:LAC). Volkswagen not only secured lithium from Ganfeng, but also agreed to collaborate on future topics such as recycling and solid state batteries. As part of its partnership with QuantumScape, Volkswagen aims to start small-scale production of solid cells as of 2025. Additionally, by the end of 2019, the carmaker plans to set up a recycling facility in Salzgitter. However, it is expected that batteries will not be returned for recycling in significant numbers until 2030.